Lara Yolu, 07100 Antalya, Turkey. 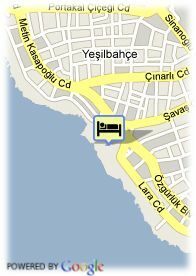 Dedeman Antalya is lcoated on the coast just 3 Kms away from the centre. The Antalya international airport is lcoated just 15 Km away. This hotel offers a spacious and quiet environment in Antalya coast, with a private beach and some recreational services to garantee a resfreshing day. Dedeman Antalya hotel offers holidays with outdoor activities, cultural visits and beach. The hotel has a private beach, swimming pool and kids club to satisfy any kind of guests. There is also a club beach during the summer, for those who want to enjoy night life in Antalya. The hotel has a fully equipped gym and a spacoius indoor and outdoor pool, connected to the aqua park. A wide selection of mediterranean cuisine is served in the hotel restaurant.